Even in a time of Democratic ascendancy, conservative voices for legalization remain important. This video of Milton Friedman discussing marijuana prohibition, posted by MPP, was brought to my attention in an email recently. Check it out, as well as the second part of it at MPP-TV. Check out this interview with Friedman about legalization of all drugs too. Last month the "Crack the Disparity" Coalition delivered petitions signed by tens of thousands of people, calling for an end to the draconian US crack sentencing laws, to the offices of Rep. John Conyers (D-MI) and Pat Leahy (D-VT), respective chairs of the House and Senate Judiciary Committees. This short video on ColorOfChange.org shows one of the deliveries, and features comments from Karen Garrison, whose two sons were unjustly caught up in these laws; and from Nkechi Taifa, who heads up justice reform efforts at the Open Society Policy Center. The ColorOfChange.org page devoted to this petition also features audio from the press conference, including former Major League baseball star Willie Mays Aikens, who served 14 years in federal prison after an untreated cocaine addiction drew him into the federal system with crack charges. Video on Abuse of the Environment -- and of People -- in Colombia's Drug War, from "Witness for Peace"
Washington, DC – On Thursday, June 11, the Senate Committee on the Judiciary, Subcommittee on Crime and Drugs will hold a hearing on Senator Webb’s legislation to comprehensively review and reform the nation’s criminal justice system. The hearing entitled “Exploring the National Criminal Justice Commission Act of 2009,” will host a number of experts in the field to discuss the need for such legislation. Senator Webb will participate in the hearing. On March 26, Webb introduced S.714 to create a blue-ribbon commission charged with conducting an 18-month, top-to-bottom review of the nation’s entire criminal justice system and offering concrete recommendations for reform. The legislation has received widespread bipartisan support and has 29 cosponsors in the Senate, including Chairman of the Senate Judiciary Committee Senator Patrick Leahy (D-VT), Chairman of the Subcommittee on Crime and Drugs Senator Arlen Specter (D-PA) and Ranking Member Senator Lindsey Graham (R-SC), and Judiciary Committee member Senator Orrin G Hatch (R-UT). In the 110th Congress, Webb chaired two hearings of the Joint Economic Committee that examined various aspects of the criminal justice system. In October of 2008, he conducted a symposium on drugs in America at George Mason University Law Center. For additional materials or to RSVP, please contact Kimberly Hunter at: [email protected]. The graphic to the left is from the web site of the Lima, Ohio, SWAT team. In January 2008, the team stormed the home of Tarika Wilson and Anthony Terry during an ordinary drug investigation. A member of the SWAT team shot and killed Wilson -- an unarmed 26-year old -- also blowing a finger off the one-year old son she was holding. Another member of the SWAT team killed two family dogs on a different floor. The police department removed the graphic from the web site following the incident. Wilson's killer was charged with two misdemeanors, acquitted, and continues to work for the Lima police department, though not for the SWAT team. Created for emergency or very high-intensity situations (snipers, hostages and the like), today SWAT teams deploy more than 50,000 times per year, mostly in low-level drug raids. This is dangerous and wrong, as the killing of Wilson, the maiming of her child, and the image the SWAT team chose to represent itself before things went bad all demonstrate. 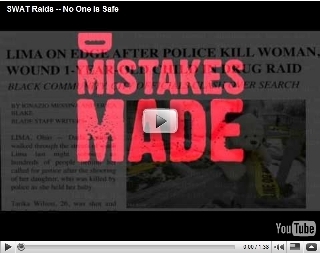 Please watch our online video, "SWAT Raids -- No One Is Safe," please forward it to your friends, and if possible please post it on your web site. When you're done, please sign the "Petition for Responsible SWAT Reform" to limit SWAT raids to when they're truly needed. Please consider donating to this effort, and thank you for helping to stop the "war on drugs." This video by "Drug Crazy" author Mike Gray is from Orange County, California -- not a liberal bastion, but medical marijuana has been state law there for over 12 years. Senior citizens are calling for access to medical marijuana, local authorities are sympathetic, and advocates are willing help. But they can't find a landlord willing to rent to them, presumably because of threats by the US DEA to use asset forfeiture laws to take the property away. Along with the sheer barbarism of these federal policies, the video also hints at what may be the largest tragedy, people who because of those policies never find out that marijuana could have helped them.